I wanted to reference aspects of New Mexico’s history particularly the Pueblo Revolt and dedicate this project to my mother. 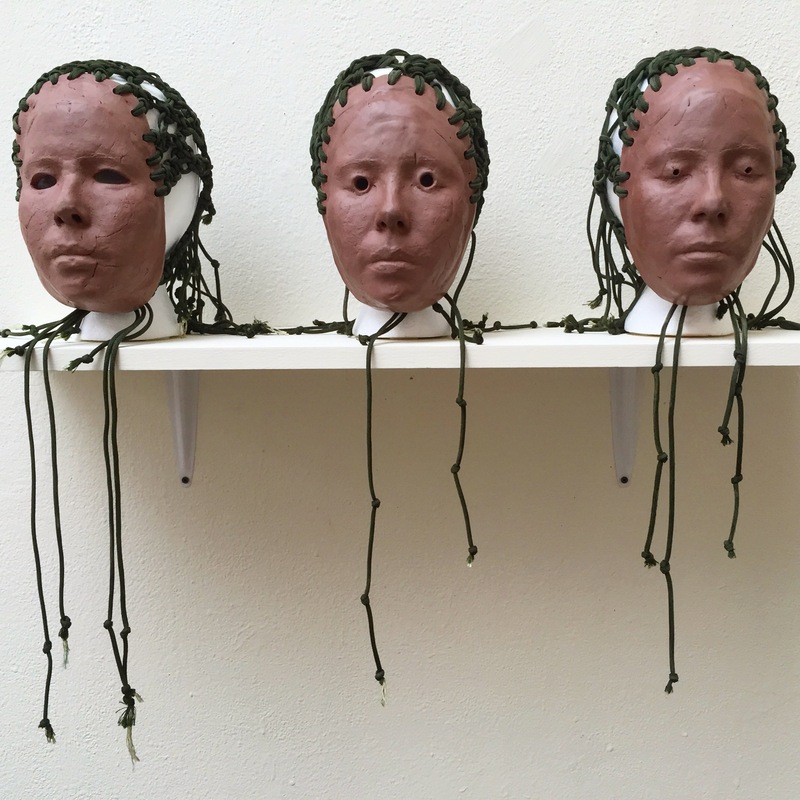 The process of these forms began with a cast of my face that I created three different mask from made of sun dried terracotta (red clay) and macrame military parachute cables. These are the three mask of ‘SEARCHING, ‘ each has a different way of seeing & experiencing the world. The first is for exploring and finding ones way, the second is for knowing and understanding. The circular eyes mimic the Ouroboros snake that consumes it’s own tail, symbolizing self-reflection and cycles. The third is for seeing without looking, its eyes are closed but is able to see. 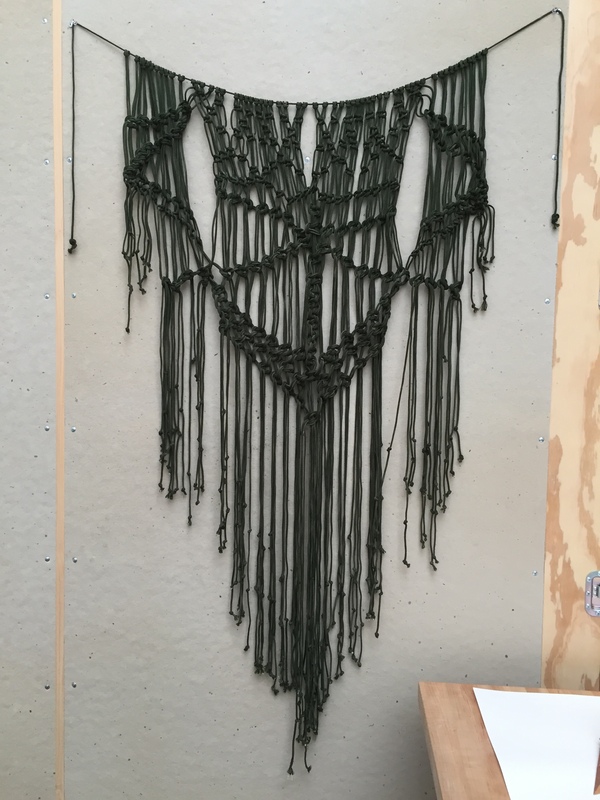 I also created a macrame shawl made of military parachute cables, it’s ends have knots like those made by the Pueblo Indians who kept knots in a rope to count down the days until the Pueblo Revolt. I had to use my whole body to create this piece, using my legs and arms to separate the cords then knot them in the right places. My goal before arriving to SFAI was to figure out how to make work again after the loss of my mother last December. This process of morning and reverence needed to be incorporated into the work. I wanted to make forms that reminded me of home. I came to the conclusion that I was what reminded myself most of my mother. 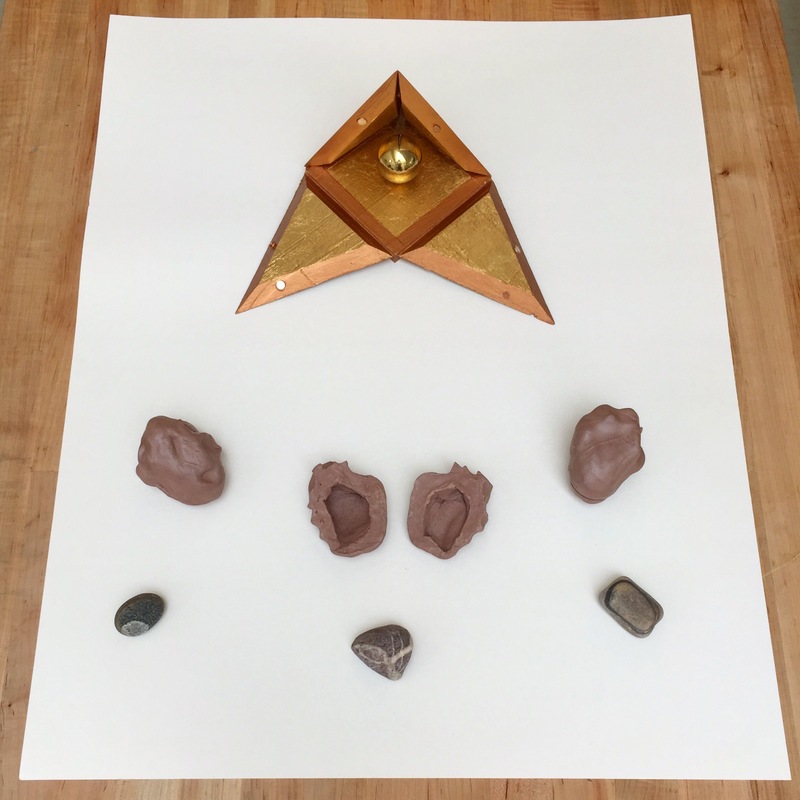 So I used stones and my own body to form these ‘objects,’ creating a heart like form; then cut them open and filled them with my mother’s ashes. Traveling through different locations throughout New Mexico I wanted to create a sense of multi-dimensional space. Bringing the viewer from below to above like a rebirth, a continual loop. I worked within abandoned Kiva’s, focusing on a constructed one at Pecos National Park. I wanted to bring back a sense of purpose for these sacred places that are now tourist attractions. Allowing them to once again be used for ritual and remembrance. Rebecca Solnit ‘s book ‘A Field Guide to Getting Lost’ sums up well my feelings as I journeyed through this project. Light at the blue end of the spectrum does not travel the whole distance from the sun to us. It disperses amongst the molecules of the air…The world is blue at it’s edges and at it’s depths. This blue is the light that got lost.